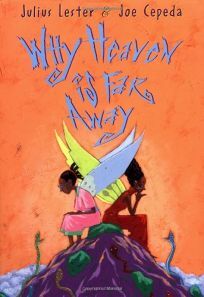 Julius Lester blends elements of two selections in his Black Folktales and brings back characters from What a Truly Cool World in Why Heaven Is Far Away, illus. by Joe Cepeda. Returning angel Shaniqua reports to God that the animals and humans don't like snakes. God sends her back to earth with poison so snakes can defend themselves, but when they go on a biting rampage, their victims escape to heaven (via ladders) and prompt God to restore peace-and to distance Heaven from earth. Cepeda's quirky, luminous oil paintings visually reinforce the hip cadence of Lester's narrative.